Senior Consultant for this Presentation. 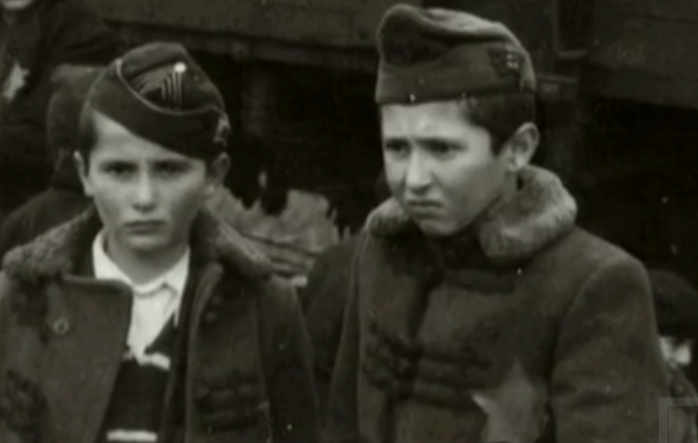 (Above) 1944: These are two Hungarian boys that have just been seperated from their family. They have been selected for death, but they don't know that yet. There is now only less than an hour and they will be gassed. They have already lived through horror having made the trip from Hungary in a closed cattle car with no sanitation. The trip took 3 days. Once they arrived they were seperated out from the family. Only a sister was to servive out of a family of 8. There is so little one can say about the murder of children without getting emotional. The purposeful extermination of children born Jewish or "ethnically unpure" is unfathomable to me. This is a special evil, an evil that was organized and supported by regular everyday types of people, like you and I. How do we understand the nature of evil and the human propensity for it? How is it these things took place? What is it in we humans that allows for this level of psychological and physical terror and violence against children? This phenomenon is not new in human history, but hit a zenith of cruelty in the extermination of Eurpoean Jewish and Gypsy children by the Nazis and by the Nazi client states. What you are about to see is shocking and disturbing. The time element becomes almost unimportant here. The children are time-less, they're the children of all time and all places, and of all people. When we view these photos we are all Jews, we are all parents. These are children here and now, in front of us. We watch them walk to their deaths. We want to stop them, save them, and protect them. But tragically most all will die in the gas chambers within a hour of their arrival by train, or will be forced into horrible tortured medical experiments or from disease. We hear many say, "Never Again" but sadly it seems it's always "Again and again".